Do you like puzzles? From the Rubik's Cube to metal cast puzzles, it can be fun to get that ol' brain of yours working, we get it. But here's the thing, you've got to be careful if you suddenly find a weird box in a strange corner of the world. It might be hell trying to trick you into letting this pinhead priest loose on humanity. If you're not prepared to cast an intense demon back to hell then you should probably just leave all box puzzles behind because if the Cenobites want you to open the box, you're going to open the box and then you're really going to come undone! This Pinhead mask will make a bone-chilling entrance to any costume party whether the unsuspecting revelers know of the Hell priest or they're blissfully unaware. 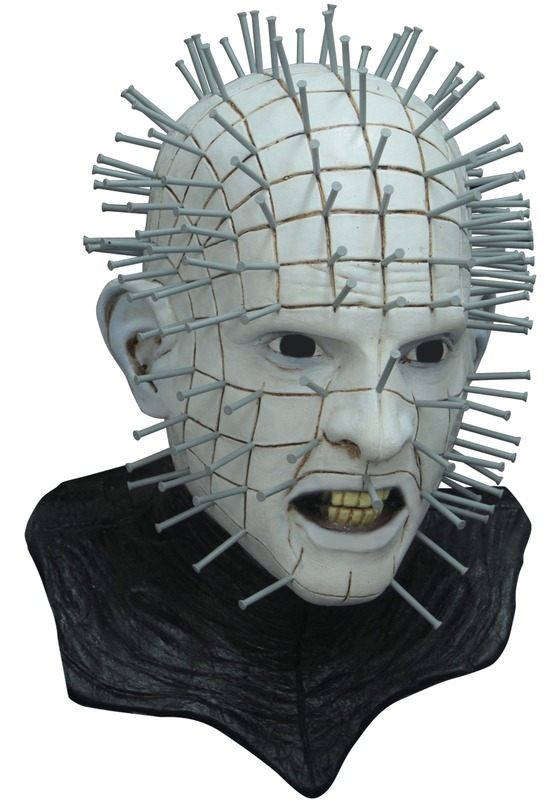 His skin is deathly pale with a bloody grid that's dotted with large nails all over the head. With full coverage, you'll feel confident in your freaky look, no matter the angle! If you're ready to get hooked this Halloween then go ahead and open that box. Or wear this mask! With a black base, you can be confident that you'll be able to scare the sin out of everyone you see! It's about time you stopped puzzling over your Halloween costume and scared up some action already!